Sassy Southern Lindsey: Welcome Home! Have you ever had an experience that was truly life changing? I feel like I have been blessed with so many things in life. I served as a recruitment counselor better known as “gamma chi” and it gave me a whole new perspective on things. I cannot believe my time in college is coming to an end. It seems like just yesterday I was going through recruitment looking for a place that I could call home. Little did I know that Alpha Delta Pi would make me grow and change into the women I wanted to be. Somehow they saw all along in me from the start. It sounds cheesy and stupid, but I mean that with all of my heart. My sisters hold a very special place in my heart. The past two weeks as a gamma chi were wonderful even though there was a lack of sleep, 100 + temperatures, and dealing with all kinds of emotions. At this point, I am a hot mess. I had 53 wonderful young girls on my floor and four amazing co’s. I could not have asked for a better experience. It was so nice to see the recruitment process from another angle. There was something about helping them through the recruitment journey and then seeing their face on bid day when they received their bid card and a t-shirt. That moment is sheer joy and stays with you forever. I remember my favorite gamma chi; I still talk to her on this day. She made an impact on me, and I hope I did that with my girls. 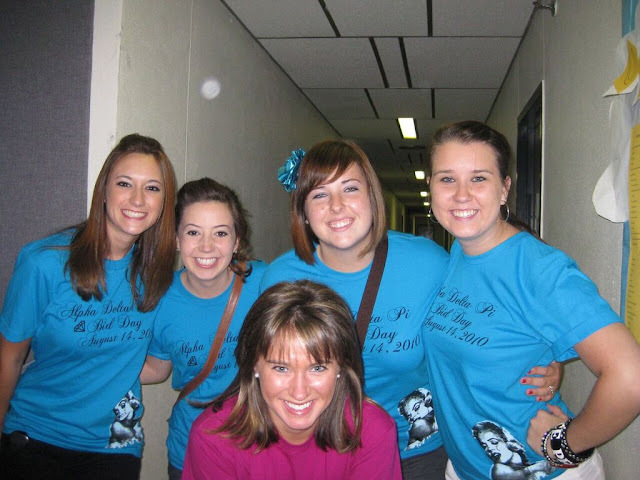 Four girls from my group pledged Alpha Delta Pi and their face light up when we did the gamma chi reveal. That was such a cool feeling; they are excited. I cannot wait to watch them grow during their college career. I am exhausted and I promise to update you more now that I have a life again!